When Sonny’s mother dies, she believes she is now alone, that is until she finds out that her biological father has died and she has been left a part of an old silk mill and relatives. Sonny heads off to Blue Hollow Falls to meet family she never knew about. Bailey is her 10 year old half sister, Sawyer, her half brother, and Addie, her father’s ex-wife. Along with them comes a small town full of artisans who are working on restoring the old mill that she is a part owner of. As the story unfolds, I loved seeing how these relationships grew and were fleshed out. Of course finding out that Sawyer is adopted and not blood opens up a whole new direction in that relationship. The wasy Sunny feels about Bailey is so sweet and to see Bailey open up was another endearing quality to this book. I enjoyed the story line and the plot was entertaining throughout the book. All the characters were likable, relatable and everyone, even the secondary characters, added to my overall enjoyment of this story. Many reviewers commented on the details and thought some could have been cut out, but with this being a first in a new series, I enjoyed finding out about the place and the characters. I am definitely looking forward to reading the next one in this series. 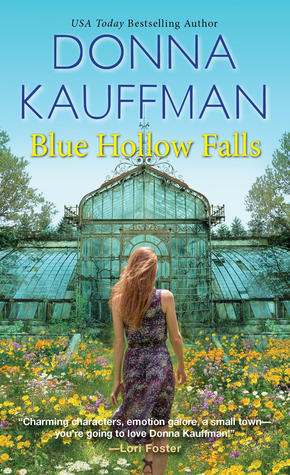 About the Author: USA Today bestseller and award winning author of the Cupcake Club series and the Blueberry Cove series, DONNA KAUFFMAN has been gratified to see her books get rave reviews in venues ranging from Kirkus Reviews and Library Journal to Entertainment Weekly and Cosmopolitan. 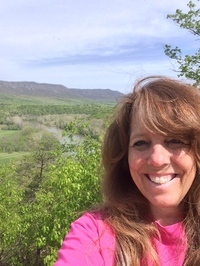 She lives in the beautiful Blue Ridge Mountains in southwestern Virginia, where she is happily working on the next book in her brand new Blue Hollow Falls series, set right in her mountain home area. When she’s not writing, she can be found recapping the popular tv show NCIS for USA Today, or escaping into her garden to play in the dirt. Donna also works as a volunteer wildlife transporter for two local sanctuaries, giving orphaned and injured wildlife a second chance at survival. You can catch up on all of her adventures via her author page on Facebook, or on Twitter, or Instagram @writerchick. Donna loves to hear from readers! You can contact her through her website at www.donnakauffman.com. Wonderful review Carla! Kind of regretting passing this one by now too. I had just read some others by Donna Kauffman when this one came out, so I picked it up.